A world-class medical campus for today and tomorrow. The Ohio State University Wexner Medical Center is a multi-disciplinary academic medical center located in Columbus, Ohio, on the main campus of The Ohio State University. The $1.1 Billion Medical Center Expansion project was part of the One Ohio State Framework, a 50-year master plan for University resources, building, and land use. In accordance with the Framework plan, the Medical Center Expansion landscape and campus strategy includes large areas of public green space. Also, underground electrical, HVAC, and technology infrastructure is being installed in a way that allows for the on-going relocation of Cannon Drive to the west and the creation of additional green space and recreation areas. Successful integration of patient services, research facilities, and medical offices is being achieved through a careful approach to site infrastructure that incorporates transportation access and facility needs. In addition, the Medical Center’s goal of creating a world-class facility calls for an exceptional user experience for patients, visitors, and medical professionals. This is being accomplished by developing a pedestrian-scaled environment of street level amenities and public open spaces. The importance of the adjacent river corridor will be emphasized and will tie into the larger green corridor plans of the University. The phased implementation plan for all exterior pedestrian spaces of the Medical Center Project One included the relocation of Spirit of Women Park, the new Cancer and Critical Care Tower Forecourt, the Phyllis G. Jones Legacy Park and Gerbig, Snell Weisheimer Children's Park, Herrick Drive Extension, the relocation of Cannon Drive and a new riverside park, along with additional infrastructure improvements. The open spaces featured as part of the new 420-bed James Cancer Hospital and Solove Research Institute include the Jones Legacy Park and the Forecourt Plaza. Together these prominent spaces combine to provide the new front door to the Wexner Medical Center Campus. The 1.25-acre Forecourt Plaza, set beneath a dramatic canopy, serves as the main entry to the new James and accommodate the active movements of patient circulation, shuttle buses, and visitor access to the adjoining parking garage. Intricate paving patterns, seating areas, planting, and a respite garden set within this area have been designed to provide places of calm for visitors, patients, and staff. Adjacent to the Forecourt, the Phyllis G. Jones Legacy Park with its great lawn, seat walls, birch grove, and native prairie grass plantings honor Mrs. Jones’ wish to create a restful, peaceful garden where patients, visitors, and staff can seek comfort and solace. 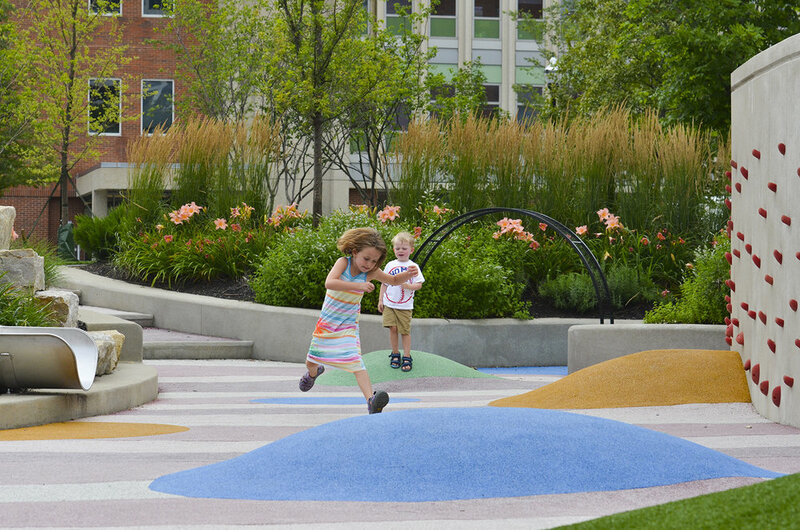 Within the park, the Gerbig, Snell-Weisheimer Children’s Park provides a place for outdoor activities specially designed for the Wexner Medical Center’s younger visitors. Custom designed play surfaces, a sensory garden, climbing wall, and a “mini” nature trail complete with overlooks and custom slide help create unique outdoor environments for play and learning.